Page 4 of ‘I Have Decided’. This image shows Jesus’ crucifixion. This image required delicate care to convey, as this is a very profound scene to most Christians. Luckily, I had an easy time with this one, as I already knew how I wanted to composite it before I even started drawing. The image reference Katy Hailes suggested to me made use of harsh black shadows, and I thought that was perfect for this scene. Because this is a children’s booklet, Katy wanted this image to be rather tame and not show Jesus suffering in death, so we both agreed to have the image viewed from behind, where the shadows would be the strongest anyway. I wanted to show Jesus on the cross leaning backwards so that God’s rays shining down on him would prove to be more visually appealing. 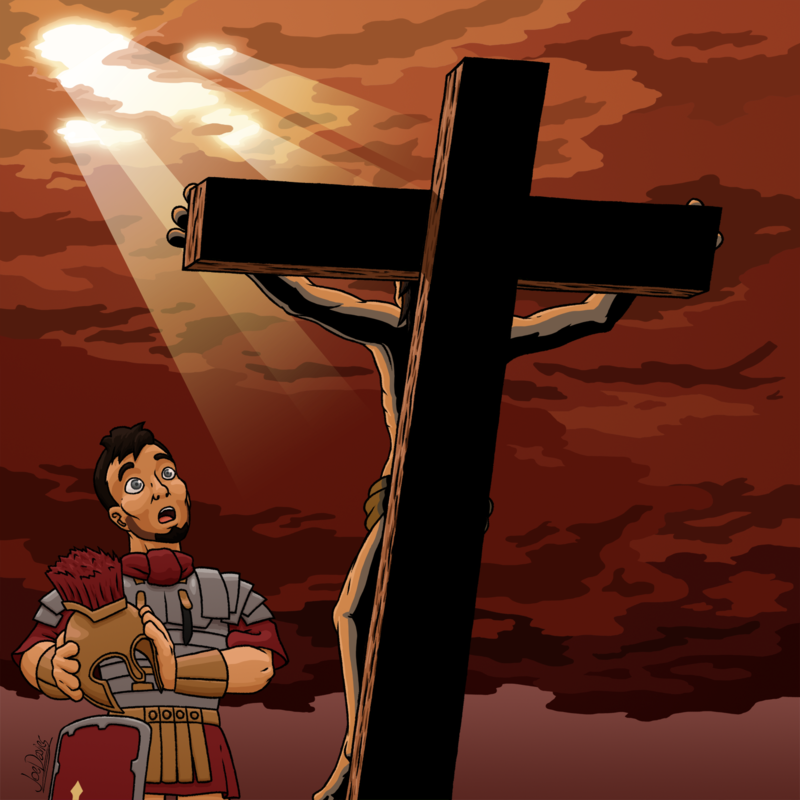 The Bible passage described a lone centurion watching Jesus’ body in disbelief as he realises that he was the son of God. I wanted to properly show his realisation by him taking his helmet off, as if it is a polite gesture towards the son of God. Katy wanted a lot of reds and oranges in the image, hence why the clouds are coloured as such. I wanted them to be coloured from orange to red going down, because the light of God is more and more visible the higher up into the sky. Admittedly, the crucifix is a lot shorter than it should be, but I made it so in order for this image to work. Hopefully that one little detail is one Christians won’t nitpick too much about.